Although the Ikan Fly X3 Go may not be the most known GoPro gimbal on the market, this American manufacturer offers high quality products which really deserve way more popularity and definitely more praise. As you’ll see in this Ikan Fly X3 Go GoPro gimbal review, this product really has everything needed to be rated one of the best GoPro Gimbals. Without wasting anymore time, let’s get down to it. Read on to learn everything you need to know about the Fly X3 Go. We’ve covered the important, relevant criteria for you, the good and the bad, to help you in your decision-making process. 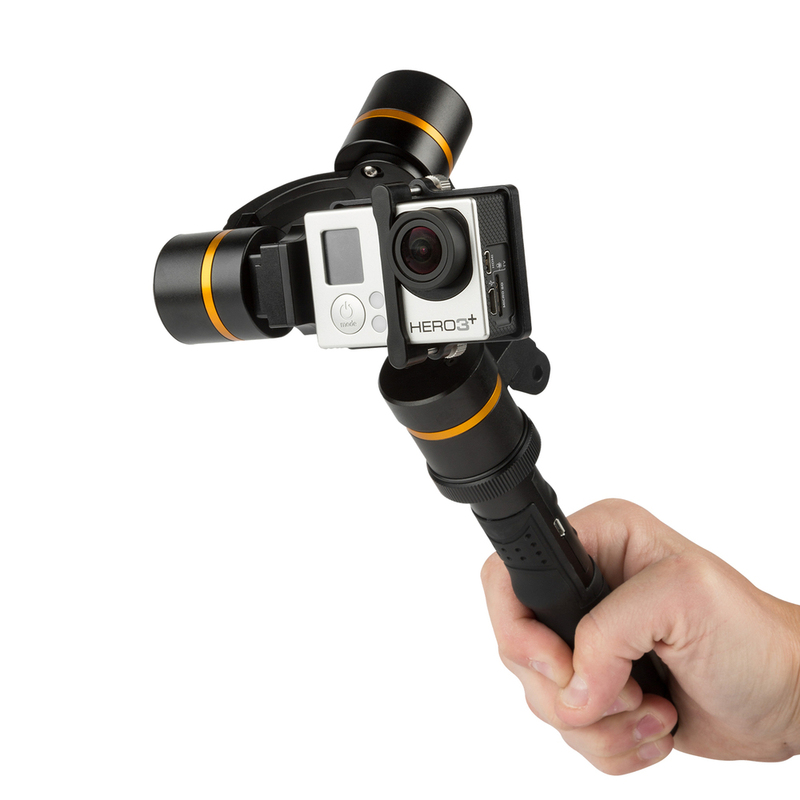 You’ll see that the Fly X3 Go is the perfect solution to your GoPro. It’s pre-programmed and ready to go out of the box, mounts to existing GoPro mounts, and is easy to use and operate. Founded in 2005, Houston, Texas-based Ikan International designs, manufactures and distributes a variety of award-winning products used in film, video and photographic productions worldwide. The Ikan Fly X3 Go sustains between two and three hours of battery life, which is good, but not as impressive as some of its competitors. For example, Zhiyun Evolution maintains twelve hours of operation while the Feiyu G5 has eight hours, and both of these products are priced less than the Ikan. It also has longer battery life than other products as well, such as the GoPro Karma Grip which only lasts a little of an hour and a half. The Fly X3 Go comes equipped with two 18350 type Lithium ion batteries which are rated at 3.7V and feature a capacity of 850mAh. A feature we really liked was the fact that we were able to charge our GoPro while in use. This function is also available on a lot of GoPro gimbals as well, such as the Feiyu G4S, G5, EVO GP Pro, and the Zhiyun Evolution. Of course, if you have a GoPro Hero 3 or 4, you won’t have to worry about charging the battery for your camera. Unfortunately, recharging your GoPro will considerably lower the battery life of your gimbal by a third. To recharge you GoPro, just use the included free cable which comes in the package. Even though this Ikan gimbal doesn’t have as long a battery life as some of its higher priced competitors, it still holds its own. The batteries are built to last and you’ll get some nice, hours long sessions with this GoPro gimbal. If you are planning a whole day of video recording, we suggest you bring along a few extra batteries in order to make sure you have plenty of juice. This will make it easier for you in the long run. Also, you can bring just one battery for your GoPro, leaving affixed to the gimbal. Both quality and reliability is important in any product just as is in with the Ikan Fly X3 Go. Everything about this gimbal seems to have been very well designed, making it a compact and resistant product. This 3-axis GoPro gimbal has very strong and efficient motors capable of working in temperatures ranging from 14°-104° F. The varied temperatures in which it can be used is further evidence of it’s high quality. We didn’t get to test the product in temperatures on the upper end of this spectrum, but we were able to test it at about 20° F during our trial run in the mountains. Everything function as it should and we didn’t notice any differences in function between using it in town versus using it in the mountains. Obviously, the Ikan Fly X3 Go is reliable in any environment. We would like to have seen more flexibility; the Fly X3 Go is a bit limited in terms of movement. With this product, you get 260° rotation on the Pitch axis, 80° rotation on the Roll, and 300° on the Pan. We were surprised that it didn’t give us a 360° Pan, but really, this is about the only criticism we have found so far. The rotation limit is disappointing, but it’s not the most important thing, either. It’s easy to compensate for. Another sign of this product’s quality is actually the box in which it is delivered in. It doesn’t come in a simple box that will just get thrown away. Instead, you get a nice, suitcase-like box that can be used to house and store your Fly X3 Go when not in use or when traveling from place to place, keeping it quite secure. We believe this shows that the manufacturer cares about their products, wanting them to be kept in the best possible conditions. In addition, the Fly X3 Go is made out of very light aluminum, which makes it very light and easy to use and it just makes sense to use this compact custom foam case in which in came for continued safety in packing and traveling. We are happy to say that we were very surprised after using this gopro gimbal from Ikan, which we had actually never even heard of before. The Fly X3 Go is one of the best we’ve tried. We did not know the brand and had no idea what to except and we were very much surprised by the quality of this product. Although the stabilization isn’t perfect, it is one of the best we’ve seen. We managed to get very smooth, stabilized videos despite the fact that we were skiing hard, fast slopes during our review of this product. We were very happy with results and we think you will be, too. This product offers creative mounting and smooth operation. In addition, the Fly X3 Go provides better control and stability for those unique shots that will set it apart from any and all other competitors. Best of all, this gimbal stabilizer comes pre-programmed to use straight out of the box! Unfortunately, the Fly X3 Go is not compatible with the newest GoPro Hero 5 Black. This Ikan gimbal was released in early 2016, so the newest GoPro hadn’t came out yet. We think this is a shame, actually, because it is such a great product; it would be better if it was more compatible. You can connect it to the GoPro Hero 4 Session with an adapter (even though the Hero 4 Session has a strange shape.) In addition, this stabilizer fits perfectly with your Hero 3 and 4 which should please their many users since they are very good action cameras. We used a GoPro 4 Black for most of our review and both the GoPro and the Fly X3 Go done their jobs perfectly! One thing that we really loved about the Ikan Fly X3 Go is the fact that you are able to separate the stabilizer from its grip. This function is very rare for gimbals; in fact, it is only available on two other products, the Removu S1 and the GoPro Karma Grip, at least for the time being anyway. On the Fly X3 Go, you can detach it thanks to its 5 feet (1.5 M) long cable. For example, you can mount it on a boom pole to simulate mini-jib movements or on top of your car while controlling it from the inside of the vehicle. The mounting is very simple, allowing you to affix it to your helmet, your car, your four wheeler, and anywhere else you can think of to put it. In addition, the included extension cable controls the yaw, pitch and roll. With some gimbals, such as the GoPro Karma Grip, you actually have to buy the extension cable separately for around $100! The Fly X3 Go includes that cable with its purchase. The only way this particular function could be any better would be if it used Bluetooth and didn’t need a cable, such as the Removu S1 which has a range up to thirty feet. Either way, you’ll be able to use the Ikan stabilizer in lots of different situations, getting video you never thought possible! It can also be mounted on a mono-pod, boom pole, or roll bar mount. We were a little disappointed, however, that this product didn’t have a mobile application in order to control the Fly X3 Go remotely. If you choose to use this product remotely, you are limited by the 59 inch (150 cm) length of the cable. The fact that you can separate the stabilizer from its grip makes this an exceptional product in spite of its inabilities. We also loved the 5-way joystick which offers complete control over pan/tilt and mode selection. We also liked the non-slip rubberized hand grip, which allows the user to maintain full control of the Fly X3 Go’s tilt, pan, and roll. furthermore, the gimbal’s operation modes, battery life, speeds, and calibration can all be controlled from the palm of your hand. In fact, even though the grip is shorter than what we had expected, it is very easy to hold thanks to the non-slip rubberized grip. It’s shape is also very good for a comfortable grip as well. We thought balancing was very easy, too, as long as you kept your finger on the central button for three seconds. If you want to shoot with the GoPro Hero 4 Black or Session, you’ll be happy to know that this gimbal will perfectly adapt itself to the weight of either of these two cameras. You will always have the best stabilization without any vibration with your videos. Another thing we liked about the Ikan Fly X3 Go was the fact that the separation of the grip and the stabilizer is not only very fast, but it is also easy to do as well. All that is needed to separate the two is to unlock the stabilizer then remove it from its grip. Even a child could learn to do it, it’s so easy. Then, you can affix your stabilizer just about anywhere you want to and enjoy it! It is very important to have a gimbal, a convenient stabilization, which can easily adapt itself to many situations. The only thing that would make us think more about this product is one we’ve already mentioned before; we would like to have a mobile application in order to control it remotely. If you’re wanting to affix it to different supports, such as a bi-pod, you’ll be happy to know that it can easily be accomplished thanks to the Ikan gimbal’s 1/4” screw hole being so universal. A standard GoPro mount is located on the bottom of the gimbal which allows you to mount this Ikan gimbal anywhere and everywhere you want to put it. Imagine all the great video you’ll be able to create using this product! Now that we’ve discussed all the important assets of the Ikan Fly X3 Go, it’s time to talk about the price. Yes, this particular gimbal is priced above some of the other stabilizers we mentioned, but it has better functionality and purpose. The current prize right now is about $319, but it is a high-end piece of technology. In addition, it is still lower than either the Removu S1 or the EVO GP PRO. Being honest, we think it’s slightly above its fair price, but it is a premium product which quells the demanding customer. To finish this review of the Ikan Fly X3 Go, we’ve put together a little list of pros and cons. Good luck with making videos and don’t forget to get your gimbal for more amazing footage! • The stabilization is unbelievably awesome! • The fact that you can separate the grip from the stabilizer to use other ways separates it from its competitors! We believe the stabilizer is worth you checking into; it’s the right investment for a product that performs as it should. If you are looking for a gimbal and this one is in your price range, we most definitely recommend it.